For those who don't yet know, one of the issues I am most passionate about is resource management. Water specifically is a huge issue for me. While I was working with the City of San Jose I worked on projects with the Water Treatment Plant and was amazed at the systems we have devised so far in saving resources. Everything from the minimization of water escaping as "waste" to purple piping innovations to using the methane given off by the digesters for energy. Something that I want to start examining, along with all the other projects I am working on, are the innovations that I hear about regarding city management and environmental policies, and the like. This stems from working on projects with the SFPUC and the Apollo Alliance. Since this is the first of these, I am going to start off small and mention today's Fresh Air on NPR. Among the other amazing stats figures and sensational information this program was displaying, the most interesting item to me was about how amazing the water system is in Las Vegas, literally the driest big city in the United States. 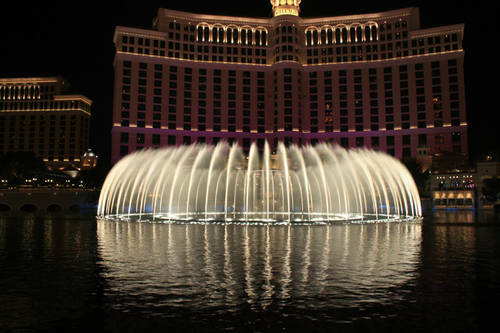 Las Vegas has been leading in innovations regarding their relationship to water. From turf reclamation programs to solar water heating incentives to, what I find most impressive, Las Vegas' water reclamation. As if the current figures and efforts weren't enough, according to Reusing Water as a Resource in Las Vegas by Sean Goldwasser et al, "it was estimated that by 2025, the valley had a reuse potential of over 90 million gallons per day (MGD). This would mean the use of reclaimed water at every golf course, park, school and other large turf areas throughout the valley." While it is true that other cities across the nation have green programs that call to rethink our relationship with water such as San Jose, New York, and Seattle, the City of Las Vegas, with its lavish decadence and countless swimming pools, water shows and aquariums, stands out like a shining jewel that other municipalities can learn from regarding efficiency. Just as an example of other efforts from somewhere a little closer to home, San Francisco recently unveiled its plan for its first large-scale water recycling project. According to Know Your H2O blog, the project would; "take treated wastewater from the Oceanside Water Pollution Control Plant near San Francisco Zoo, run it through fine membranes and ultraviolet-light systems, and spread it through the network of existing pipes and sprinklers snaking through the parks. The water could also serve to flush toilets at the California Academy of Sciences." These efforts come about as a result of the Bay Area Water Supply and Conservation Agency (BAWSCA) an Agency that was created "to represent the interests of 24 cities and water districts, and two private utilities, in Alameda, Santa Clara and San Mateo counties that purchase water on a wholesale basis from the San Francisco regional water system" who has a unique focus on recycled water programs.